Editor’s Note: This is the first in a series of stories about the Kiwanis Club of St. Catharines, leading up to its 15th annual duck race fundraiser on June 16. The faces and projects have changed, over the years, but one thing has remained the same for theSt. Catharines Kiwanis Clubsince it was chartered in 1935 — its commitment to the community. Gone are the days of it being a boys-only club, consisting of predominantly businessmen. It’s been replaced with a group of members, both male and female, who come from diverse backgrounds. 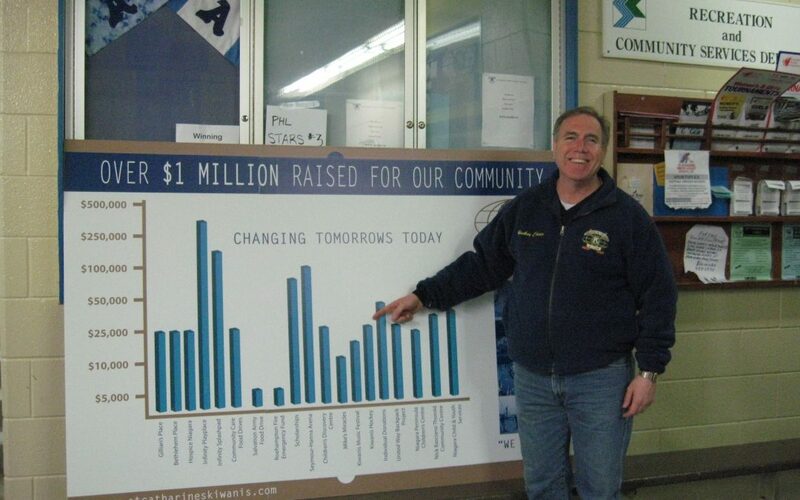 The fundraising and community projects have also changed immensely over the decades. Long gone is the Junior Boys Poultry Club and the Kiwanis Horse Show. Now, the closest they get to poultry is the annual duck race. Rollathons and Christmas nut sales have disappeared over the years, instead replaced with Kiwanis TV Bingo, and the Ultimate Gaming Competition. Bill Irwin said even during his tenure with the club since the early 1970s, much has changed in the Kiwanis world. It’s all about being progressive, however, and adapting to the evolving world around them. The club was chartered August 4, 1935 at the Leonard Hotel in downtown St. Catharines. Sponsored by the Niagara Falls Club, there was a strong core of charter members to help get the club up and running. Some were successful over the years, such as the horse show. In the early years it was the largest project the club sponsored, and was held at the riding and driving club grounds on Queenston Street from 1957 until 1965, when it shifted to the Garden City Raceway. Irwin said the show eventually ended, but it was a great success over the years. Other events were not so successful. A Passion Play, for example, was a financial failure. The three-day event brought the famous Passion Play from Germany and included Kiwanis members and their wives making up the crowd scenes. Fortunately, the successful outweighed the not so successful, and the club forged ahead with activities like the Mile of Money, a Peach festival, spaghetti dinners, garage sales, a Christmas nut sale, and even rollathons. Today, major fundraisers include the TV Bingo, held in partnership with clubs in Niagara Falls and Welland, the annual duck race in Port Dalhousie, and a new gaming challenge that has proven to be a popular attraction. Of course there have been some ups and downs throughout the years. The duck race was in jeopardy once when the ducks floated off in Lake Ontario and headed to Toronto. Another time, the trailer burnt and they had to be replaced. The club has been resilient, though, and this year holds its 15th annual duck race June 16. Today you can even buy your tickets online at www.kiwanisduckrace.ca. Irwin said community support has always been a central focus of the club. Whether it was supporting community centres and sports groups in the early days, or building playgrounds, splash parks and sponsoring major sports facilities such as the Kiwanis artificial field, and the new Kiwanis Aquatics Centre in St. Catharines, there has always been a strong commitment to community. One of the first large projects was the Infinity accessible playground on Niagara Street. They’ve supported sports associations, like Kiwanis hockey, and they’ve even built senior citizens’ apartments. The club numbers have gone up and down over the years ranging anywhere from 40 to nearly 90, but currently there are about 60 members in the club. Some meet regularly on Thursdays, while others work hard behind the scenes to contribute. “We’ve really built a strong club in St. Catharines,” said Irwin. The club always welcomes new members to help keep the evolution going. Anyone is welcome — shown through the motto, “Ordinary people. Performing EXTRAORDINARY work.” For more information on the club, its activities, and membership, you can visit http://kiwanisstcatharines.com/.